This article is about a corporation established in 2007. For Rosatom government body in 2004—2008, see Rosatom (Federal Agency). Rosatom, (Russian: Росатом, tr. Rosatom, IPA: [rɐsˈatəm]) stylized as ROSATOM and also known as the Rosatom State Nuclear Energy Corporation, the State Atomic Energy Corporation Rosatom, or the Rosatom State Corporation, is a Russian state corporation headquartered in Moscow that specializes in nuclear energy. Established in 2007, the organization comprises more than 360 enterprises, including scientific research organizations, the nuclear weapons complex, and the world's only nuclear icebreaker fleet. The state corporation is one of the leaders in the world's nuclear energy industry. The organization ranks first as the largest electricity generating company in Russia, producing 202.868 bln kWh of electricity, 18.9% of the country’s total electricity production, in 2017. The corporation also ranks first in the largest portfolio of foreign construction projects: 33 nuclear power plant units in 12 countries. Rosatom also manufactures equipment and produces isotopes for nuclear medicine, carries out research, material studies; it also produces supercomputers and software as well as different nuclear and non-nuclear innovative products. Rosatom’s strategy is also to develop renewable energy, and has announced it will invest in wind power. Rosatom with its 1/3 world market share takes the lead in global uranium enrichment services and covers 17.7% of the global nuclear fuel market. Rosatom is a nonprofit organization, and while its tasks include the development of nuclear energy, the growth of enterprises of the nuclear fuel cycle, and the fulfillment of the functions assigned to it by the state, it also ensures national security (nuclear deterrence), nuclear and radiation safety, as well as development of applied and fundamental science. In addition, the state corporation is authorized on behalf of the state to fulfill Russia's international obligations in the field of the use of nuclear energy and of non-proliferation of nuclear materials. Rosatom is also involved with large-scale projects such as ITER and FAIR. As of Jan 2017, the total portfolio orders of Rosatom reached $300 billion. The history of the Rosatom is linked with the history of the nuclear industry in Russia and its predecessor, the Soviet Union. On June 26, 1953, by the decision of the Council of Ministers, the First Main Directorate under the Council of Ministers supervising the nuclear industry was transformed into the Ministry of Medium Machine Building (Minsredmash). In addition to developing and testing nuclear weapons, the ministry also dealt with production of nuclear power. In 1954, the world's first grid-connected nuclear power plant, Obninsk, was opened and put under operation under the direction of Igor Kurchatov, a Soviet nuclear physicist in Obninsk, Kaluga Oblast. As the Soviet nuclear industry grew, so did the ministry, and from the 1970s to the 1980s, more than 1.5 million people worked in the ministry's organizations and enterprises. In 1989, Minsredmash and the Ministry of Atomic Energy merged to form the Ministry of Nuclear Engineering and Industry of the USSR. The Ministry for Atomic Energy of the Russian Federation [(Russian: Министерство по атомной энергии Российской Федерации, also known as Minatom (Russian: Минaтом)] was established as a successor to the Russian part of the Ministry of Nuclear Engineering and Industry of the USSR on January 29, 1992 after the dissolution of the Soviet Union. The newly created ministry received about 80% of the enterprises of the union department, including 9 nuclear power plants with 28 power units. 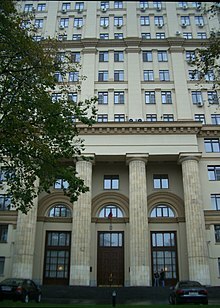 Under this name, the ministry existed until March 9, 2004, when it was transformed into the Federal Agency on Atomic Energy, also known as Rosatom, in accordance to presidential decree. Physicist and academician of the Russian Academy of Sciences, USSR State Prize winner laureate, and former Minister for Atomic Energy Alexander Rumyantsev was appointed head of the agency. On November 15, 2005, he was replaced by Sergey Kiriyenko. In 2006, the agency adopted target program "Development of the Russian Nuclear Energy Complex for 2007-2010 and for the Future to 2015" which 26 nuclear power units were to be launched in Russia before 2020. On December 1, 2007, Russian President Vladimir Putin signed a law adopted by the Federal Assembly under which the Federal Atomic Energy Agency were to be abolished, and its powers and assets were to be transferred to the newly created "State Atomic Energy Corporation Rosatom." On December 12 of the same year, the agency transformed into a state corporation with Sergey Kiriyenko appointed general director. In July 2008, Rosatom adopted an activity program designed to last till 2023. Rosatom's positions were further strengthened by the transfer of the nuclear civil icebreaking fleet FSUE Atomflot under Rosatom's jurisdiction. In 2009, nuclear technologies is assigned as one of the priorities for developing Russia's economy. By 2011, Rosatom's investments in research and development work have grown seven-fold compared to 2006. Another important direction of the development of the corporation was an increase in its influence on foreign markets, since the number of contracts for the construction of nuclear power plants abroad was almost doubled in 2011. According to Sergey Kiriyenko, the ten-year portfolio of orders of Rosatom State Corporation abroad was estimated at more than $100 billion at the end of 2014. A programme of government support for the construction of nuclear power plants will finish in 2020. In 2017, Rosatom decided to invest in wind power, believing that rapid cost reductions in the renewable industry will become a competitive threat to nuclear power, and has started to build wind turbines. Rosatom was also concerned that nuclear export opportunities were becoming exhausted. In October, Rosatom was reported to be considering postponing commissioning new nuclear plants in Russia due to excess generation capacity and that new nuclear electricity prices are higher than for existing plant. The Russian government is considering reducing support for new nuclear under its support contracts, called Dogovor Postavki Moshnosti (DPM), which guarantee developers a return on investment through increased payments from consumers for 20 years. As of the beginning of 2014, Rosatom included more than 360 organizations of various organizational and legal forms. Most of them belong to the enterprises of the nuclear power complex, which includes organizations of nuclear energy, nuclear engineering, and the nuclear fuel cycle, including enterprises for the exploration and production of natural uranium, conversion and enrichment of uranium, production of nuclear fuel, electricity and equipment, development of new technologies of nuclear fuel and gas centrifuge technological platform. The civilian assets of the Russian nuclear industry are concentrated within Rosatom's holding company Atomenergoprom, which unites more than seventy enterprises. The companies of the nuclear power complex of Rosatom are integrated within separate divisions: mining, fuel, sales and trading, machine building and electric power divisions, foreign construction divisions and the construction division in Russia. The functions of the mining division include exploration, extraction and processing of uranium. The managing company of the Russian uranium mining assets of the corporation is ARMZ Uranium Holding. The main uranium mining enterprise in its composition for more than 40 years is the Priargunsk Mining and Chemical Association, which extracts up to 90% of uranium in the country. Foreign assets are managed by Uranium One, a Canadian holding company owned by Rosatom. Rosatom is the world's fifth largest producer of uranium and the second largest in terms of uranium reserves. The fuel division of the state corporation consolidates assets specializing in conversion and uranium enrichment, managed by the holding company TVEL. The division's tasks include the fabrication of nuclear fuel, conversion and enrichment of uranium, and the production of gas centrifuges. Owning 36% of the world's market share, Rosatom is the leader in the world market of services for uranium enrichment. Concentrating plants of the corporation under the management of the unified company "Separation-Sublimate Complex" are the Angarsk Electrochemical Plant in Angarsk, Irkutsk Oblast, Zelenogorsk Electrochemical Plant in Zelenogorsk, Krasnoyarsk Krai, Ural Electrochemical Plant in Novouralsk, Sverdlovsk Oblast, and the Siberian Chemical Plant in Seversk, Tomsk Oblast. The sales and trading division is managed by Techsnabexport. Its tasks include the export of services to the international uranium enrichment market and uranium products. Techsnabexport was founded in 1963 as a foreign trade agent of the Soviet nuclear industry, the company is known on the foreign market under the trademark TENEX. In 1993, a Russian-American intergovernmental program, the Megatons to Megawatts Program, in which the aims were converting highly enriched uranium extracted from Russian nuclear warheads into low-enriched uranium for use by American nuclear power plants, was signed thanks to Techsnabexport's efforts, and lasted until 2013. By the end of the agreement, about 500 tons of weapons-grade uranium were recycled from 20,000 Russian warheads. The fuel thus produced provided about half of all energy produced by US nuclear power plants (and about 10% of all electricity produced in the US). The machine-building division is represented by holding company Atomenergomash, founded in 2006 . The division's enterprises produce equipment for the construction of nuclear power plants and other facilities for both the nuclear industry and related industries. Atomenergomash consists of about thirty large companies, including production enterprises, engineering centers and research organizations in Russia, Ukraine, Czechia, and Hungary. The total number of employees in the company is over twenty-five thousand people. According to the group's own data, 13% of nuclear power plants in the world and 40% of thermal power stations in the CIS and the Baltic states use the holding equipment. In addition, Atomenergomash is the largest producer of equipment for the VVER reactor and the world's only producer of the fast-neutron reactor (BN). OKB Gidropress, which develops the current Russian nuclear reactor VVER, is a subsidiary of Rosatom. OKBM Afrikantov, which develops the current Russian BN-series such as BN-800 and BN-1200, is a subsidiary of Rosatom. The management company Rosenergoatom operates all of Russia's nuclear power plants and represents the electric power division of the state corporation Rosatom. As of July 2017, ten nuclear power plants (35 power units) operated in Russia with a total capacity of 27.9 GW, producing about 18% of all electricity produced in Russia. As a result of reforms and reassignments in the period from 2012 to 2014, Rosatom's engineering activities were concentrated within the management company Atomenergoproekt-Atomstroyexport (NIAEP-ASE), based in Nizhny Novgorod. Earlier, Atomstroyexport was engaged in foreign construction, and a number of independent engineering institutes with the name Atomenergoproekt were engaged in the design and construction of facilities in Russia: Moscow, St. Petersburg, and Nizhny Novgorod. Since October 2014 on the basis of NIAEP-ASE, Rosatom forms a unified engineering division, not including design company on nuclear power facilities and technologies Atomproekt. According to Kommersant, such a strategy is aimed at eliminating internal competition, deliberately created earlier. This measure can be effective from the economic point of view in view of a large number of domestic and foreign orders. Rosatom is one of the world leaders in the number of simultaneously constructed power units. In addition to the construction of new power units for existing plants, the state corporation is building five new stations in Russia and three abroad. It has also announced plans to build a nuclear power plant in the Buysky District in Kostroma Oblast. The construction of the station began in 1979, but stopped in 1990. In 2008, Rosatom decided to resume the project - a station with two power units with VVER-1200 reactors is planned to be built by 2030. Moreover, according to the strategy of territorial planning of Russia in the field of energy that was approved in November 2013, three more new stations are planned to be built by 2030: the South Ural Nuclear Power Plant near Ozyorsk, Chelyabinsk Oblast, Tatar Nuclear Power Plant near Kamskiye Polyany, Tatarstan, and replace the decommissioned Sibirskaya Nuclear Power Plant with the Seversk Nuclear Power Plant in Tomsk Oblast. According to analysts of the Atomic Expert magazine, in the period from 2014 to 2030, 30 power units with a total capacity of 35.5 GW are planned to be put into operation in Russia (17 power units with a total capacity of 13 GW are expected to be launched during the same period). Construction of a nuclear power plant in Kaliningrad started on 25 February 2010 but construction was suspended for the project to be redesigned. Tianwan Nuclear Power Plant in Lianyungang, China on 8 October 2010. Rosatom owns 67% of the world nuclear plant construction market and, currently, the orders portfolio exceeded $133 billion. Rosatom has taken the lead in offering nuclear power plants to emerging countries. 37% of nuclear reactors under construction worldwide being built by Rosatom itself, usually the OKB Gidropress' VVER type. Rosatom received $66.5 billion of foreign orders in 2012, including $28.9 billion for nuclear plant construction, $24.7 billion for uranium products and $12.9 billion for nuclear fuel exports and associated activities. Nuclear power plants in China, India, and Iran, were either designed and built by Rosatom or with the corporation's participation. Rosatom is involved with the construction of the Tianwan Nuclear Power Plant in China, the construction of Unit № 2 of Kudankulam Nuclear Power Plant in India, and the construction of Unit № 1 of the Belarusian Nuclear Power Plant in Belarus. In December 2013, Rosatom signed a €6.4 billion contract with Fennovoima in Finland of the single-unit Hanhikivi NPP using OKB Gidropress' VVER-1200 pressurized water reactor in the town of Pyhäjoki, with construction planned to start in 2018 and commencement planned in 2024. On 11 November 2014, Rosatom's General Director Sergey Kiriyenko and head of Atomic Energy Organization of Iran Ali Akbar Salehi have signed a Protocol to Russian-Iranian Intergovernmental Agreement of 1992, according to which the sides will cooperate in construction of eight power generating units with VVER reactors. Four of these reactors are planned to be constructed for the second construction phase of Bushehr Nuclear Power Plant and the other four will be constructed on another site. Construction of Bushehr Units 2 and 3 started on March 14, 2017 with units planned to be completed in 2024 and 2026. In December 2014, Rosatom and the MVM Group of Hungary signed an agreement for the construction of new station units of the Paks NPP with construction planned to start on 2018. Rosatom also started construction of Turkey's Akkuyu NPP on December 10, 2017. The state corporation has also signed agreements with Egypt on construction of the El-Dabaa NPP and with Bangladesh on construction of the Rooppur NPP, with construction starting on November 30, 2017. Failed bids includes the cancellation of Units 3 and 4 of Khmelnitskiy NPP in Ukraine. Since 2008, the structure of Rosatom includes the Russian nuclear icebreaker fleet, which is the largest in the world with five nuclear-powered icebreakers (four operated), a container ship, and four service vessels. Its tasks include navigation on the routes of the Northern Sea Route and rescue operations in ice. Operation and maintenance of the fleet is carried out by FSUE Atomflot, also known as Rosatomflot, a company based in Murmansk. To prevent nuclear and radiation hazards, Rosatom handles radioactive waste and spent nuclear fuel, as well as the decommissioning of nuclear power and energy facilities, in the last stage of the nuclear fuel cycle. Processing and storage of radioactive waste and spent nuclear fuel are carried out by the Mining and Chemical Combine, the Federal Center for Nuclear and Radiation Safety, the V. G. Khlopin Radium Institute, and sometimes FSUE Atomflot. In 2008, the follow companies were subjected to specialized Russian companies dealing with radioactive waste management, later merged to the federal enterprise RosRAO. The company JSC Rosatom Overseas, established in 2011, is engaged in the promotion of Russian nuclear technologies abroad. Its tasks include the integration and promotion of the global proposal of the state corporation, as well as the implementation of projects for the construction of nuclear power plants outside of Russia. The main institutes of Rosatom, conducting fundamental and theoretical research, are the Institute of Experimental Physics and the Institute of Technical Physics, both based in the closed city of Sarov. The holding company Atomenergoprom also includes research and development as OKB Gidropress, OKBM Afrikantov , Research Institute of Chemical Technology, Research Institute of Inorganic Materials, Research Institute of Atomic Reactors, Institute of Physics and Power Engineering, and the Troitsk Institute for Innovation and Thermonuclear Research. The development of chemical fibers and carbon fiber reinforced polymers are done by JSC Khimpromengineering, owned by the holding company UMATEX. In addition to civil facilities, Rosatom also includes military enterprises. Nuclear Weapons Complex Directorate includes nuclear centers in Sarov and Snezhinsk, the Mayak company in Ozyorsk, the plant Elektrokhimpribor in Lesnoy, and the Instrument-Making Plant in Tryokhgorny. Strategies, policies and objectives of Rosatom are established by its Management Board, consisting of fourteen people, including the General Director. The board is headed since 2016 by General Director Alexey Likhachev. The sole executive body of Rosatom is the General Director, who manages the day-to-day operations. Sergey Kiriyenko, who headed the Russian nuclear industry in 2005, became general director of Rosatom since its creation until he got replaced in October 5, 2016 by Alexey Likhachev, former Deputy Minister for Economic Development. Natalia Davydova - Director of "Environmental Projects Consulting Institute"
On 28 June 2017, The Financial Times criticized Rosatom for the lack of transparency through its expansionist agenda as its role as a "Kremlin-controlled company". On 20 March 2018, this criticism was underlined by the Bellona Foundation as well, focusing on the scarce data available on Rosatom's progress in Sudan. ^ a b "Итоги деятельности Государственной корпорациипо атомной энергии «Росатом» за 2017 год" (PDF). p. 12. ^ "Results and Activities Rosatom 2014" (PDF). Rosatom. Retrieved 23 February 2018. ^ "About us". rosatom.ru. Retrieved 2018-02-01. ^ a b c d Росатом Archived 2014-12-19 at the Wayback Machine // РБК Инновации. ^ a b Отечественный локомотив экономического прогресса // Деловая газета. — Декабрь 2010. — С. 66—67. ^ "Putin ratifies law on formation of Rosatom". www.world-nuclear-news.org. Retrieved 2018-02-26. ^ "Портфель зарубежных заказов "Росатома" на 10 лет превысил $100 млрд". Interfax.ru (in Russian). 2014-12-11. Retrieved 2018-02-08. ^ "Rosatom chief outlines commercial vision". World Nuclear News. 8 March 2017. Retrieved 10 March 2017. ^ Foy, Henry (28 June 2017). "Rosatom powers through nuclear industry woes". Financial Times. Retrieved 2 July 2017. ^ Cottee, Matthew (2 August 2017). "China's nuclear export ambitions run into friction". Financial Times. Retrieved 6 August 2017. ^ "Rosatom considers delaying reactor commissioning". Nuclear Engineering International. 30 October 2017. Retrieved 6 November 2017. ^ a b c "All enterprises". www.rosatom.ru. Retrieved 2018-02-21. ^ "nuclear energy – russian atomic energy complex - аtomenergoprom - enterprises". atomenergoprom.ru. Retrieved 2018-02-15. ^ "Российский уран оказался в генеральских руках". Retrieved 2018-02-15. ^ ""Росатом" избавляется от лишнего". Коммерсантъ. 2014-08-19. Retrieved 2018-02-15. ^ "Fuel and enrichment". rosatom.ru. Retrieved 2018-02-15. ^ a b "Обогащение урана". rosatom.ru. Retrieved 2018-02-15. ^ "Russian warhead fallout keeps America warm". www.nuclearpowerdaily.com. Retrieved 2018-02-15. ^ "Половина атомной энергии США вырабатывалась российским оружейным ураном". Retrieved 2018-02-15. ^ "Our company". OKB Gidropress. Retrieved 20 September 2011. ^ "Nuclear Power - Атомэнергомаш". www.aem-group.ru. Retrieved 2018-02-15. ^ "Единый атомный подрядчик". Газета "Коммерсантъ". 2014-10-14. p. 11. Retrieved 2018-02-15. ^ ""Росатом" начал строительство Балтийской АЭС". РИА Новости (in Russian). 2010-02-25. Retrieved 2018-09-04. ^ "Балтийская АЭС: "примерно восемь реакторов мощностью 40 МВт каждый" - ?! - Bellona.ru". Bellona.ru (in Russian). 2013-06-13. Retrieved 2018-09-04. ^ "Генподрядчик подтвердил приостановку проекта Балтийской АЭС мощностью 2ГВт". Interfax.ru (in Russian). 2013-06-13. Retrieved 2018-09-04. ^ "Строящиеся АЭС". rosatom.ru. Retrieved 2018-02-15. ^ "Сейсмомониторинг района будущей АЭС под Костромой проведут в этом году". РИА Новости (in Russian). 2014-09-18. Retrieved 2018-02-15. ^ "Утверждён план строительства Южноуральской, Татарской, Северской, Костромской и Нижегородской АЭС". Атомная энергия 2.0 (in Russian). 2013-11-21. Retrieved 2018-02-15. ^ "Атомный эксперт #1-2/2014". Scribd. Retrieved 2018-02-15. ^ a b "Строящиеся АЭС". www.rosatom.ru. Retrieved 2018-02-20. ^ "Emerging Nuclear Energy Countries | New Nuclear Build Countries - World Nuclear Association". www.world-nuclear.org. Retrieved 2018-09-04. ^ "ROSATOM plans to expand nuclear construction abroad". rosatom.ru. Retrieved 2018-09-04. ^ "Пульс Тяньваньской АЭС-2". Атомная энергия 2.0 (in Russian). 2014-08-25. Retrieved 2018-02-20. ^ "NPCIL: пуск реактора II блока АЭС "Куданкулам" сдвинут на 2015 год". РИА Новости (in Russian). 2014-10-30. Retrieved 2018-02-20. ^ "На БелАЭС завершен монтаж самого мощного в Беларуси подъемного крана | Информационно-справочный портал Беларуси - interfax.by". www.interfax.by (in Russian). Retrieved 2018-02-20. ^ "Fennovoima taps Russian supplier for nuke project". Yle Uutiset. September 3, 2013. Retrieved September 8, 2013. ^ "The real front in US-Russia 'Cold War'? Nuclear power". cnbc. 2014-03-23. Retrieved 2014-11-28. ^ "Две трети местных жителей поддержали проект финской АЭС "Ханхикиви-1"". РИА Новости (in Russian). 2014-10-28. Retrieved 2018-02-21. ^ "Строительство турецкой АЭС по проекту РФ хотят начать весной 2015 г". РИА Новости (in Russian). 2014-10-11. Retrieved 2018-02-21. ^ "Россия и Иран договорились о строительстве восьми энергоблоков АЭС". Атомная энергия 2.0 (in Russian). 2014-11-11. Retrieved 2018-02-21. ^ a b "Парламент Венгрии одобрил соглашение с Россией по расширению АЭС "Пакш"". РБК. Retrieved 2018-02-21. ^ "Iran starts building unit 2 of Bushehr plant". www.world-nuclear-news.org. Retrieved 2018-02-21. ^ "Rosatom aims for $72bn in foreign orders for 2013". Nuclear Engineering International. 13 November 2013. Retrieved 15 November 2013. ^ "Россия и Иран расширяют сотрудничество в области мирного использования атомной энергии". 2014-11-11. Retrieved 2014-11-11. ^ "Яценюк: Украина достроит АЭС без участия россиян". Росбалт. Retrieved 2018-02-21. ^ "Атомный эксперт #1-2/2014". Scribd. Retrieved 2018-02-21. ^ "Turkish PM says no reason to halt Akkuyu plant with Russia". REUTERS. December 14, 2015. Retrieved December 25, 2015. ^ a b "Nuclear Power Reactor Details — BUSHEHR 2". International Atomic Energy Agency. Archived from the original on 4 June 2011. Retrieved 13 August 2010. ^ a b "Iran and Russia celebrate start of Bushehr II". World Nuclear News. 12 September 2016. Retrieved 23 January 2017. ^ a b "Официальный старт проекта АЭС "Бушер-2" в Иране намечен на 10 сентября". РИА Новости (in Russian). 2016-09-01. Retrieved 2018-03-21. ^ Kudankulam nuclear plant begins power generation. Mumbai Mirror (2013-10-22). Retrieved on 2013-12-06. ^ "Construction of Kudankulam NPP 2nd stage has commenced". www.rosatom.ru. Retrieved 2018-03-21. ^ "Construction work for Kudankulam Nuclear Power Project 3,4 units to begin soon: Scientist". The Indian Express. 26 January 2017. Retrieved 12 February 2017. ^ a b "Строящиеся АЭС". www.rosatom.ru. Retrieved 2018-03-21. ^ "Hungary, Russia sign 3 Paks implementation accords". 9 December 2014. Retrieved 27 July 2016. ^ "The Nuclear icebreaker fleet". www.rosatom.ru. Retrieved 2018-02-21. ^ "Old Russian icebreaker to become floating command center". arctic.ru. Retrieved 2018-09-04. ^ "Nuclear and radiation safety". www.rosatom.ru. Retrieved 2018-02-25. ^ "Ядерная и радиационная безопасность". www.rosatom.ru. Retrieved 2018-02-25. ^ "Home". www.rusatom-overseas.com. Retrieved 2018-02-25. ^ "Прикладная и фундаментальная наука". www.rosatom.ru. Retrieved 2018-02-25. ^ "Supervisory Board". www.rosatom.ru. Retrieved 2018-02-14. ^ "Management Board". www.rosatom.ru. Retrieved 2018-02-21. ^ "Director General". www.rosatom.ru. Retrieved 2018-02-14. ^ "Public Council". www.rosatom.ru. Retrieved 2018-03-01. ^ "Public Council". www.rosatom.ru. Retrieved 2018-02-26. ^ Foy, Henry (2017-06-28). "Rosatom powers through nuclear industry woes". Financial Times. Retrieved 2018-09-04. ^ "Rosatom reportedly offering unlikely floating nuclear power deal to Sudan - Bellona.org". Bellona.org. 2018-03-20. Retrieved 2018-09-04.